It was this greenish Model 66 Stabilis that caught my eye: a combination of a well-curated curve with an oversize acrylic barrel without any trim at all, a design I have never seen in the pendom. Good reviews of were spread across the internet, but despite all my appraise, I didn’t own one until five months after first seeing it. The reason? Nothing to do with my budget; I wasn’t tight on budget, especially concerning the modest price range of this pen. Nor did I fake my love to the Model 66; I love the subtleness of the overall design. However, the real problem for me at that time was, I just didn’t know how to choose from the 30 nibs it was listing in the selection menu. It may sound absurd for those who are acutely aware of the difference between a stub nib and an italic one, but it did become a high bar for a newcomer into the realm of English calligraphy such as me to understand the actual denotation behind all those jargons. Therefore, I was overwhelmed by the diversity of options. Even after reading through the description page of nibs in Franklin Christoph’s website, I still had no idea about the writing experience of each nib, especially for some apparently overlapping offerings, i.e., an HPS Medium C. Italic (Masuyama) or an HPS S.I.G. Medium? Setting in front my pale monitor, I let my impetus go and only kept this pen on my waitlist, along with all other mumbo jumbo stuff you may also have imagined. If I didn’t spot a less busy Franklin’s booth on the ending day at this year’s Baltimore Washington International Pen show, I would probably still be scratching my head, guessing the differences between each nib grinding. However, despite all the previous confusing experience, the ultimate experience of buying the Model 66 was just inspiring and amusing. Unlike most of the other exhibitors, Franklin-Christoph set up their booth in a manner that anyone could set him or herself down casually in one of the armchairs in front of the desks. This design makes it super easy for anyone to have an in-depth look and try out of each of Franklin’s product while talking with the staff. I spent around 20 mins immersing into all kinds of nib grinding in different nib size. Surprisingly, I found the stainless HPS Medium nib suits me way much better than other nibs if I want to write both English and Chinese. To my surprise, after paying my bill, the staff told me I should wait for a while and see their nib meister put everything together in front of me. It turned out this is not just simply an on-site assembly, but also a small-scale one-on-one customizing workshop: Jim Rouse, the resident nib meister, observed my writing habits of both English and Chinses and gave my pen three runs of tuning until I was comfortable with the result. He told me he had made two ultra sweet point at the tip of the nib so that I can enjoy writing two kinds of language. The result did work: every time I picked up my Model 66 during the past week, I was always ingratiated by how good it was. And one little note to that putting everything together is that no further money was needed for this skill-demanding and time-consuming process. With those said, it seemed clear to me that one huge feature of Franklin-Christoph is that its pursuit to a wide range of customizing choices works best if a customer is visiting their booth in person at a pen show. 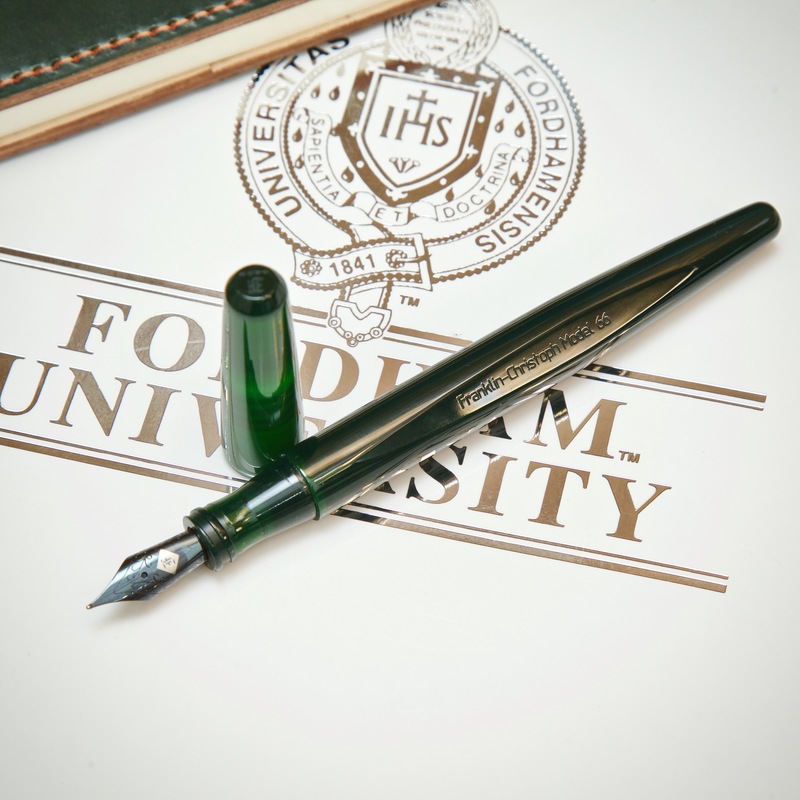 In the first place, the mix of its design, QC, and pricing of Franklin-Christoph can hit directly into the pain point of fountain pen lovers. Therefore it is quite normal to find people who buy into this brand own more than one Franklin’s pen—once you get familiar with its philosophy (nib selection is the most important one of them), it is just a no brainer to go if you want to have something fun to write with. However, the conversion of an ordinary person into a loyal customer need one essential element, which is to conquer the learning process of understanding its nibs’ lineup. Obviously, the most efficient way to do this is to pay a visit to Franklin’s booth in person with an open mind. And the default process of on-site customizing with its nib meister not only drives the outcome of the product to a higher level but also deepen buyers’ perception of its philosophy, leaving a unique service experience. The in-person experience with the brand could be highly interactive and intuitive, while the online version might be more of a series of lonely research and guessing. 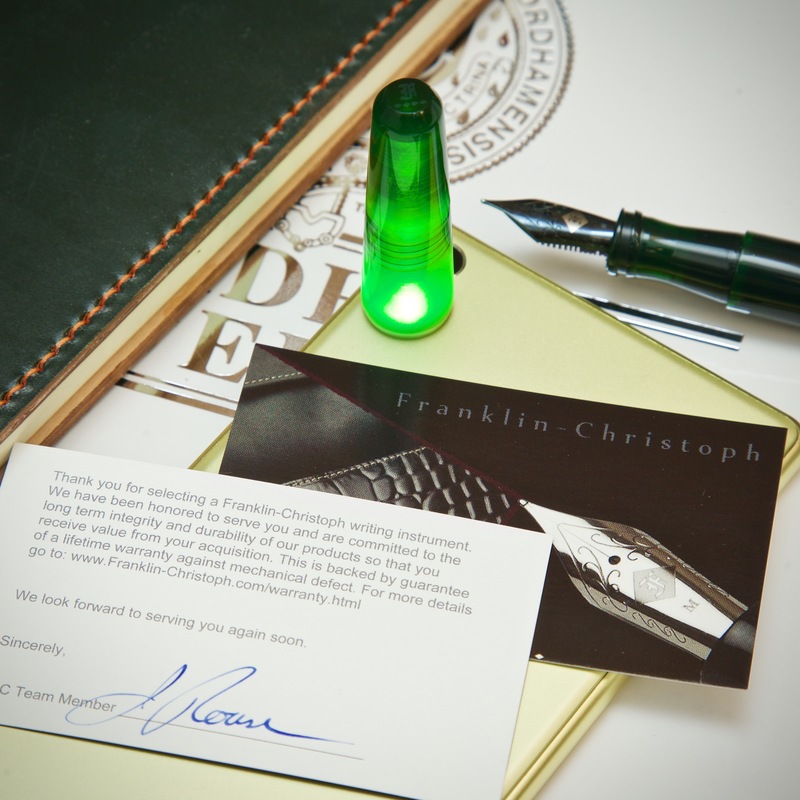 Due to the limited number of both pen show and its in-house nib meister, this service-product package that Franklin-Christoph is offering could hardly be scaled up and may still exist as a niche and precious phenomenal in the pen market. One final thought: while the decision to whether scale up a business practice may go way back to its owner, the bombarding of choices to online buyers may be a huge drawback if this business wants to be sustainable by getting more new customers. Great Article! Thank you for posting your thoughts on this pen.